This Conway Twitty guitar clock is so unique that it has a found a home in a new museum. A Conway Twitty guitar clock I unearthed has found a home in the new Conway Twitty Museum in Louisiana. The clock features Conway Twitty’s smiling face including his signature hair and initial chain. “Conway” is spelled out in gold on the guitar’s neck and the whole piece is coated in a black, glossy lacquer. It was made by DO-Be clocks. Quite frankly I couldn’t believe the clock was just sitting there at an estate sale. I swooped on it with obvious delight to the amusement of other locals who were checking out more traditional fare. Yup, I admit it. I love the hard to find. It could be an urbane Arne Wahl Iversen desk or a Conway Twitty guitar clock. Unusual is fun! Obviously, the Conway Twitty Museum’s Founder, Linda Darbonne, shared my delight when she subsequently swooped on the clock when I listed it on Ebay. (Lots of swooping by all involved). Linda shared the fact that she is a museum founder and owner, which is, let’s face it, pretty impressive. How many people do you know who have started their own museum? She also graciously agreed to answer a few questions about her museum, which opened in October 2016 in Branch Louisiana. Linda got hooked on Conway Twitty as a 10 year old and attended 10 of his concerts over the years. 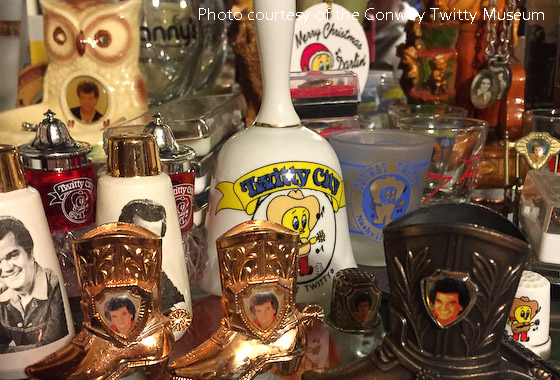 She began collecting Conway Twitty memorabilia after his death in 1993. She said the most unique item in her museum is a pair of Conway Twitty and Loretta Lynn dolls. Her most favorite is a recent addition – a baby blue, embellished vest worn and owned by the man himself. Linda is committed to keeping Conway Twitty’s music alive. During her museum’s opening, she said CT Henderson traveled from Ohio to perform Conway Twitty songs for the attendees. She plans on a yearly event – a Conway Twitty Tribute – where different folks will sing his hits. If you are interested in learning more, you can find The Conway Twitty Museum on Facebook or you can contact Linda directly on 337-331-2135. Hi Sarah! Your comment made smile. Was imagining someone getting squeezed out the door by an avalanche of Conway Twitty memorabilia. Thanks for visiting! The picture you are seeing is the only thing I have. The clock was sold to the Conway Twitty Museum. It is run by a nice lady, Linda Darbonne, who is an incredible resource on all things Conway Twitty. Contacting her would be your best bet.